Another eye-catching type of kayak from Greenland is the one found on the East coast. The weather conditions of East Greenland were different from the west, so this kayak has a different shape. First of all, these kayaks are built with very little volume. The kayak is purposely built low and small, so that it fits the paddler like a glove. The hull is special, with a single, hard chine that gives it a high degree of secondary stability. 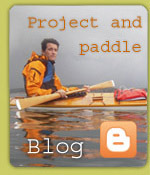 The result is a kayak that's easy to paddle, suitable for day trips and the like. It's easy to maneuver and is stable despite being narrow. For veteran paddlers, this kayak is ideal for play and eskimo rolls. Many people prefer this kayak for its smooth, graceful lines. The small volume gives the kayak very low weight.